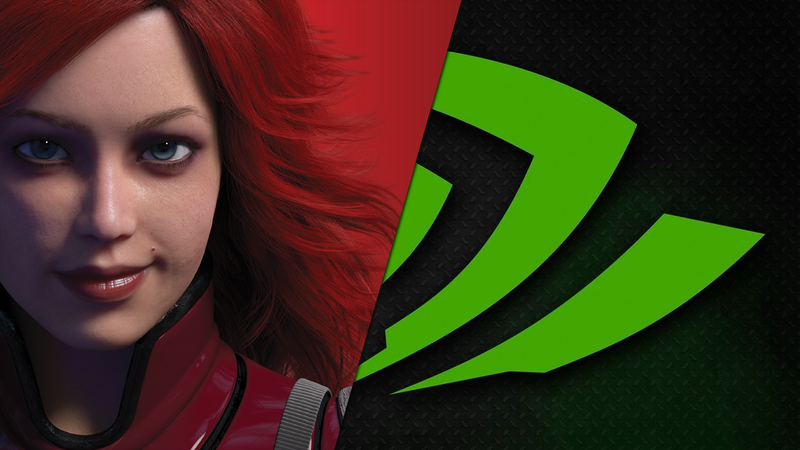 Today’s a special day as we gracefully welcome two new flagships from Nvidia and AMD. The GTX 1090 Ti 8GB and the R9 495X 8GB, both benchmarked and reviewed. So strap in folks, this is going to be a hell of a ride. We’ve been waiting for this day for so long and it has finally arrived, bringing with it the fastest graphics cards to ever grace our footsteps. Both featuring the world’s most advanced FinFET Graphics Processing Units boasting the highest levels of performance we’ve seen yet. First off we have the GTX 1090 Ti, Nvidia’s latest Pascal flagship. Featuring a full fledged GP102 GPU with 30 SPMs, Streaming Pascal Multiprocessors, for a total of 3840 CUDA cores. In addition to a 256bit GDDR5X memory interface, with 8GB of 12Ghz GDDR5 memory for a total of 384GB/s of memory bandwidth. The GTX 1090 Ti operates at base clock of 1212Mhz and a boost clock of 1372Mhz. Making this is by far the highest clocked graphics card Nvidia has ever introduced. The GP102 GPU is the most complex chip the company has ever made packing more than 10 billion transistors. 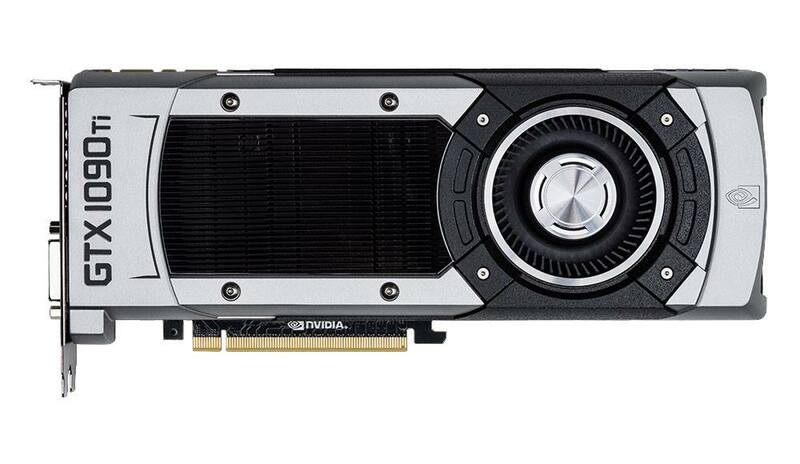 Nvidia is positioning this card as a direct replacement to the GTX 980 Ti. However, thanks to the next generation FinFET process the GP102 GPU is significantly smaller than GM200 and significantly more power efficient. Additionally, thanks to its smaller size Nvidia can price it more aggressively. Which brings us to the most exciting part about this new product and that is its price,. At $499 the 1090 Ti is not only faster, more power efficient and smaller but also cheaper. Moving on to the physical aspects of the GTX 1090 Ti, Nvidia has decided to go with its standard blower style cooler but with the brushed aluminum finish similar to the 980 Ti. Although looks can be deceiving as Nvidia has told us that the GTX 1090 Ti features an updated vapor-chamber that will be deployed across the company’s new NVTM heatsinks. This next generation vapor-chamber heatsink was developer by Cooler Master in collaboration with Nvidia and it was developed specifically for Pascal. The new patented design is dubbed VaporWorks™ and it delivers 21% better thermal performance than its predecessor. In addition to VaporWorks™ Nvidia has also updated the blower fan with new hydraulic motors that use less power and generate fewer decibels of noise. Moving on to the Red Team. This is the first time that we’ve ever got to see the R9 495X. This is the company’s flagship single GPU 400 series Polaris based. It Features a Polaris GPU that we haven’t heard of before today, called Polaris 12. Polaris 12 features 5120 GCN 4.0 cores and 256bit wide GDDR5X memory interface feeding 8GB of 12.0Ghz GDDR5X memory chips. The result is 384GB/s of memory bandwidth, exactly the same as Nvidia’s GTX 1090 Ti. So it seems both company’s decided to opt for smaller memory interfaces for their high-end designed, off-set by the significantly faster GDDR5X memory from Micron. The R9 495X features a Polaris 12 XT GPU which is the fully unlocked variant of the chip. The graphics card runs at a boost frequency of 1170mhz, making it the highest clocked graphics card every introduced by AMD. Once again thanks to the FinFET manufacturing process technology we’re seeing much higher clock speeds than before. At 312mm² Polaris 12 is only slightly smaller than GP102, primarily because while Polaris 12 is based on the 14LPP manufacturing process from Samsung, Nvidia’s GP102 is made using TSMC’s 16FF process. Just like the GTX 1090 Ti, the R9 495X is priced at $499. So let’s take a quick look at the brand new cooling solution AMD is bringing to market with its latest single GPU flagship graphics card. 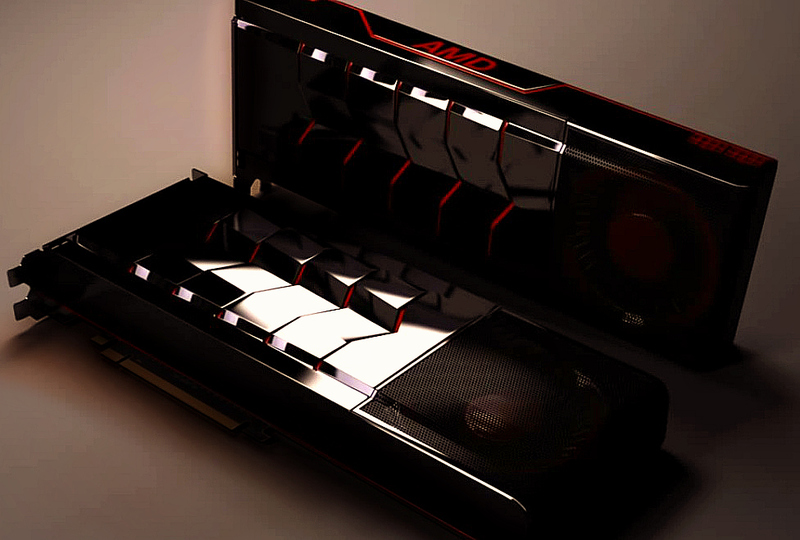 Aesthetically speaking this is undoubtedly the best looking exterior design we have seen yet from AMD. The black metal exoskeleton really shines thanks to a beautiful contrast of red , led-lit, accents and AMD logo as well as a beautiful zinc mirror finish. It’s not just all about looks either. The carved gills on the side are actually open and work to exhaust heat outside of the exoskeleton with the help of the peripherally placed 85mm blower fan. This design which AMD dubs WraithShark™ is 37% quieter and 23% cooler than AMD’s standard design. As you have probably noticed by now the R9 495X features a black metal mesh that covers the blower fans. This removable tight black mesh works as a dust filter that protects the fan and the internals of the card. To prevent the tight mesh from adding to the acoustic footprint of the fan, the fan has been moved 4mm in and the mesh has been curved outwardly by 5mm. The end result is a very elegant and simple solution that prompts us to beg the question why hasn’t this been thought of before? With the specs finally out of the way let’s see how these beasts actually perform in the latest and greatest titles. Our benchmarking suite only consists of the most demanding games out there right now running at the highest possible settings. at maximum settings and torturous resolutions. Let’s start off with the brand new Solitaire VR. With all the graphics settings cranked up to the max, the game looks absolutely gorgeous. It transports the player to a a virtual reality presence that’s borderline indistinguishable from, you guessed it, actual reality. The R9 495X and the GTX 1090 Ti both were able to provide a wonderfully immersive experience here with over four thousand FPS. Let’s move on to one of the more demanding games out there, the infamous Minesweeper. This game continues to be a PC buster, you need a really capable gaming rig to enjoy this game at a resolution as high as 360×240. Thankfully, the latest Polaris & Pascal graphics cards from AMD and Nvidia did not disappoint. Running the game with all the settings maxed out at 360×240 the GTX 1090Ti and the R9 495X average just over three thousand FPS. While three thousand FPS isn’t as high as we were hoping, it’s just enough to deliver a playable and relatively smooth overall gaming experience. Now let’s look at how the cards perform when we present them with a real challenge. We’re not only going to be cranking up the resolution to 640×360, otherwise known as 31.7K for no apparent reason, but we’re also going to test one of the most demanding applications out there, Microsoft Word. This will really put these cards to the test and show us whether these gaming grade products can also be put to use in a demanding real-world professional workload. Unfortunately both cards ran out of memory at 31.7K , as 8GB is simply nowhere near enough for this type of workload at 640×360. The result is a rather poor framerate of two thousand frames per second. The application felt rather choppy throughout and we found it quite hard to actually do any work on our document under such a low framerate. Dropping down the resolution to a more reasonable 360×240 improves things quite a bit. The cards no longer run out of memory and the framerate jumps to over three thousand FPS. For our thermal and acoustic testing we used a Corsair C90 case with two intake fans and one exhaust fan. We tortured both graphics cards using the most intensive workload o the bunch, Microsoft Word at 640×360. As we’ve already established this is really a very demanding workload. Both cards reached temperatures in excess of 30c. Which at first might seem worryingly high, however this is very much an extreme case scenario as we don’t expect that too many people out there would even consider running word at such a high resolution. Not a whole lot of gamers are interested in heavy professional workloads nor will the cards reach temperatures as high as this while the GPU is idling. So I really wouldn’t worry too much about it. Moving on to the noise test, again inside the same C90 case. The same case without either GPU installed produces 27dB of noise. The GTX 1090 Ti registers 4 decibels lower than the R9 495X, however both cards are practically silent. The noise levels aren’t as low as last year’s GTX 990 Ti and the R9 395×2 both of which featured active noise cancelling technologies,ThermX™ from Nvidia and FreeFlow™. The notable absence of both technologies we’re told were the very tight engineering tolerances associated with such implementations. Which rendered them very expensive, and as both the R9 495X and the GTX 1090 Ti are $499 graphics cards rather than $1999, a more traditional approach makes a lot more sense. Finally, after four years of waiting the first FinFET GPUs are here and they are every bit as good as everyone expected them to be. Both cards from Nvidia and AMD put on a good show today and played an instrumental part in giving us a glimpse into the future. Things that were once thought impossible like playing Solitaire in virtual reality or even running Minesweeper at a playable framerate were proven to be within reach.